Designed in London, created in Greece. Dida plays, with elegance. She moves wildly, but beautifully. She is Herself. 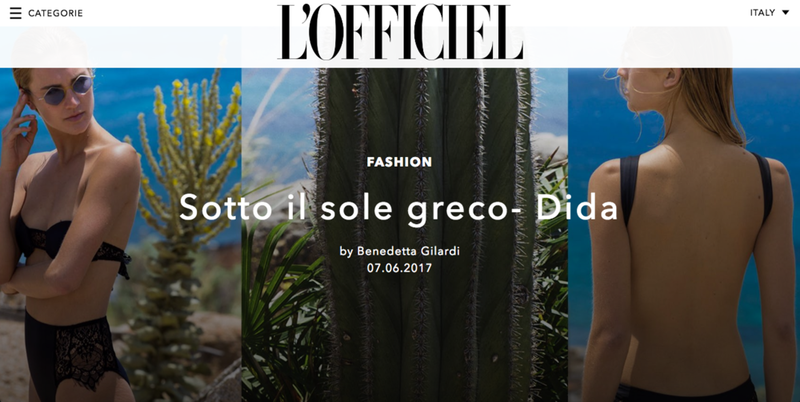 Under the creative direction of Dimitra Tzima Tsitampani, DIDA's debut collection for Summer 2017 was created with versatility in mind. With the belief that swimwear should not only be worn by the shore, but is an essential style companion that takes you from day to night (and everywhere in between). DIDA is the first thing worn in the morning, the last one taken off in the evening. Nine months of designs, research and work brought to life new and better technical solutions. The collection looks into the comfort and functionality of the costumes worn by skaters on the ice, while maintaining in the swimwear the delicate sensuality unchanged, using light fabrics with a cotton feel and lace details. A swimming suit that embraces the body, follows the shape of the body and becomes like second skin.